Marie Salomea Skłodowska Curie, together with Pierre Curie and Henri Becquerel received the 1906 Nobel Prize in Physics for the discovery and analysis of radioactivity, and she alone the 1911 Nobel Prize in Chemistry for isolating Radium and Polonium. It was work of brilliance and extreme perseverance. Nevertheless she faced severe career obstacles, mostly because she was a woman, partly because she was Polish. Marie Salomea Skłodowska became a student of Pierre Curie and he was her first champion. They fell in love and were married. They had two children, (one of whom, Irene, later also won a Nobel Prize). Then, while crossing the street, Pierre was killed by a passing horse and carriage. THE RADIANT begins as Mme Curie tries to deal with the aftermath of his death. She is assisted and encouraged by a former student, a brilliant Paul Langevin, who is Catholic, and married. They have a passionate affair. 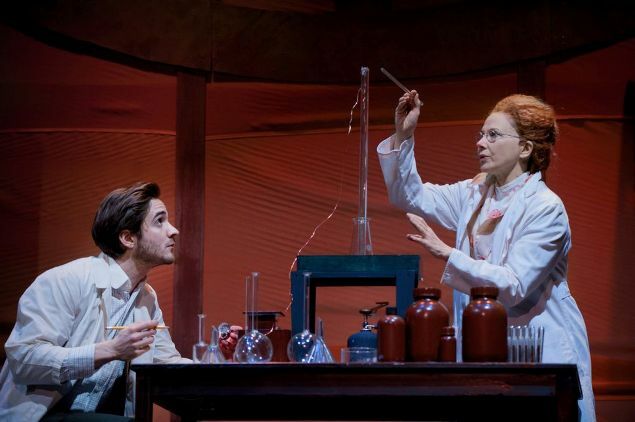 THE RADIANT is a serious, distinguished play that credibly portrays the energy, persistence, commitment to surviving and becoming a success, brilliance, dedication to science, personality and passion of Mme Curie. The play is very nicely cast, the simple set is well dressed, the hair and makeup and costuming well done, to bring to vivid life a re-creation of this great woman and her work and her affair with Paul, and the milieu of their lives in the years after 1906. In part because of its integrity; in part because of the interest and importance of its story and the brilliance of its characters, this is a play to be seen. It's interesting and entertaining. Some relatively minor issues: The first act has a lot of information to convey about who Marie Curie is and why we should care about her -- it's very interesting, but still quite a lot of exposition mixed into the drama. The whole play could use a bit more humor. And the final scene very satisfyingly ties up a lot of loose ends, but it is something of an anti-climax, and a bit of a downer (but not enough to make this a tear-jerker). 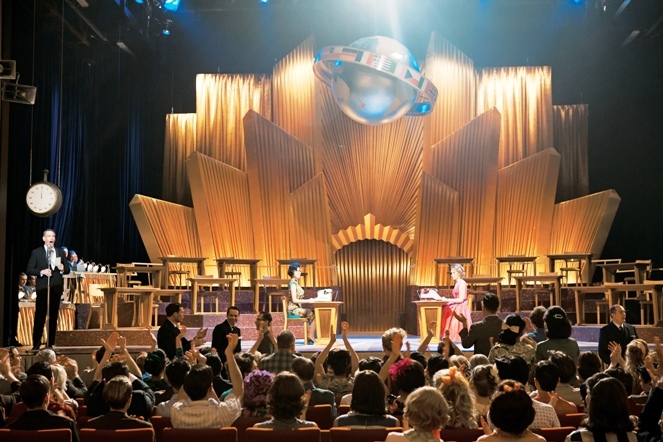 A play like this would do well to find a long life visiting college theaters, community productions, and perhaps a residency at some big-city playhouses, where it could entertain and inform -- and provide a valuable and enjoyable service to many people. The Radiant performs Thursday through Saturday evenings at 8:00pm, Sundays at 3:00pm. There is one additional performance Monday March 4, at 7:00pm. 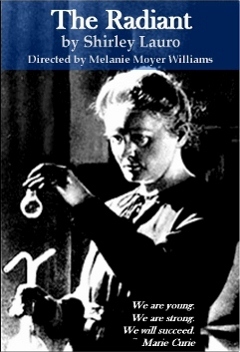 1910 -- Publication of Marie's textbook "Treatise on Radioactivity"
Note: Marie & Pierre Curie's granddaughter, Hélène Joliot (see video below), married Langevin's grandson, Michel Langevin. - "The Hobbit: An Unexpected Journey"
- "Snow White And The Huntsman"
Here are a few selected stories from QPORIT about people and films that are up for awards! The RENDEZ-VOUS WITH FRENCH CINEMA is always one of the highlights of the year. The current program looks like an especially interesting selection of films, with some extra, special events. I am particularly looking forward to a Transmedia Program that will be new for the Rendez-Vous. It is part of the Film Society's recent commitment to transmedia -- programming that merges elements from many media, often including live, filmed, interactive and web events all as part of the same event. RENOIR must be one of the best looking, visually rich films ever, with Christa playing Renoir's model, and muse to both Renoir pere et fils! (both father and son). The film luxuriates in the spectacular landscape and the sensual joy of painting. Berenice Bejo, star of THE ARTIST, who was here in NY at the 2011 New York Film Festival, will be in the Opening Night Film. Audrey Tatou will be visiting New York in person. Romain Durin will present the Opening Night film, POPULAIR, and he will be present for the screening of second film, PERSECUTION, as well! Many other directors and actors will be here in person presenting their films. Several new films have precursors in past film history. Georges Franju's 1962 film of THÉRÈSE DESQUEYROUX, which stars a young Emmanuelle Riva (more recently seen in AMOUR), will be shown... as well as the new version by Claude Miller. RENOIR, about the painter and his son, the filmmaker Jean, will be presented along with three of the classic films by Jean Renoir. Stuck in the provinces of 1950s France, Rose (Deborah François) is taken under the wing of her handsome boss (Romain Duris) and develops astonishing skills as a high-speed typist, leading to unexpected fame. In the grand tradition of French social comedy, Régis Roinsard has concocted a scintillating entertainment lovingly looking back on an idealized and innocent decade. Starring Deborah François, Romain Duris. The Weinstein Company will release the movie in July 2013. Arriving from the Paris outskirts for a round of weekend clubbing, good-looking Victor (Eliott Paquet) and his Central European friend Rainer (Dominik Wojcik) are full of self-confidence and a youthfully self-conscious hipness. But across the span of one night, their impulsive adventure tests emotional and physical limits the lads never before knew in Klotz’s impressively mesmerizing feature debut. Winner of the 2012 Prix Jean Vigo. A TLA Releasing film. Based on a true case, writer-director Winocour has adapted the story of a progressive 19th century doctor/therapist and his unusual patient into a study of personal wills, hidden desires and reversals of fate. A maid who suffers from seizures is sent to a mental hospital, where it seems she’ll be condemned for life until Professor Charcot finds in her the possibilities of testing his advanced notions of the sources of so-called “hysteria.” Soko as Augustine and Vincent Lindon as Charcot deliver astonishing performances. A Music Box Films release. 25-year-old Louise is suddenly hit with a double dose of life-altering reality: She learns that she’s pregnant and that her mother has had a relapse of advanced cancer. Justine Lévy has adapted her own novel with spiky humor and brilliance, and director Mille mines the complex family material for an amazingly wide range of tones from poignant to irreverent. Izïa Higelin, Carole Bouquet, Bob Geldof and Arthur Dupont co-star. Jean Renoir, 1932, France, 84 min. Boudu (the irrepressible and unforgettable Michel Simon), a Parisian tramp, tries to end it all with a plunge into the river, only to be saved by a well-meaning bookseller. But when his rescuer offers him shelter, Boudu’s anarchic charms rock the household to its foundations. Shot largely on location along the quays of the Seine, Renoir’s freewheeling satire of bourgeois respectability is one of the master’s most innovative early works; it remains, in the words of critic Dave Kehr, “as informal, beguiling, and subversive as its eponymous hero.” Screening in a digital restoration. Raised like a wild child in the woods by his bitter and fearsome father, a boy finds himself discovering the world beyond the forest in director Dessaint’s enchanting visualization of Jean-Francois Beauchemin’s novel. The sensitively rendered hand-drawn animation and depth of characterization seem like a tribute to the films of Hayao Miyazaki, and yet, this movie for all ages stands very much on its own. Featuring the voices of Jean Reno, Lorànt Deutsch, Isabelle Carré and the late Claude Chabrol in his final film credit. Lost in a maze of his philosophizing while trying to write a book, a retired math teacher is forced to deal with the real world when he must rescue a young woman from the clutches of a thug outside his Paris apartment. What the teacher doesn’t know is that this woman may be his muse, a mystical agent or an angel of death. Stars director Brisseau and Virginie Legeay. Winner of the Golden Leopard, Locarno Film Festival 2012. Although he made no effort to see his grandmother in her waning years, pharmacist Armand (director Podalydès’ brother and co-writer Denis) must now deal with her funeral arrangements. This is awkward enough, but nothing like his emotional swings between a wife he can’t quite part from and a lover he can’t quite commit to, in a comedy stamped with the Podalydès brand of caustic, Gallic wit. With Valérie Lemercier, Isabelle Candelier, Catherine Hiegel and Benoît Hamon. Swept up in the increasingly dazzling and inventive fiction writing of a precocious student, a high school literature teacher and frustrated author (Fabrice Luchini) married to a gallerist (Kristin Scott Thomas) sees real life overtake the fiction. Ozon is at the height of his powers in this ironic, cautionary tale on the dangers of mentoring gone too far. With Emmanuelle Seigner and Ernst Umhauer. A Cohen Media Group release. A true sports story that utterly defies the odds, Duguay’s film captures the wild ups and downs of the Olympics-bound career of legendary equine star Jappeloup and his troubled rider, locked in a tense relationship with his horseman father and forever uncertain of his own skills as an equestrian. Stars Guillaume Canet, Daniel Auteuil, Marina Hands and Tchéky Karyo. Depardon’s brilliant self-portrait (co-directed by his longtime collaborator and sound engineer Claudine Nougaret) takes a surprising point of view on the great documentarian’s life—not only as a filmmaker, but as a photographer of expressive precision, capturing the entirety of French society over the decades. The patience of this imagemaker’s practice is testament to an alternative to the hyper-fast, instant delivery of digital images that now dominates the culture. Offered a job in Paris to look after a fellow Estonian-born woman, Anne leaves her homeland and finds herself in an emotional hornet’s nest. Frida, the elderly Estonian, gives new meaning to the word prickly and won’t be tended to, even though that’s exactly what Frida’s younger ex-lover wants. Stars a stunning, flinty and memorable Jeanne Moreau, Laine Magi and Patrick Pineau. Radio France is a massive 24/7 operation, a national network which explores every aspect of life from breaking news to live cultural events. Applying his attuned senses to the mega-complex that is Radio France, non-fiction film master Philibert reveals the vast, rich and unexpected world of radio production and the imaginative power of sound. Preuss’ uncommonly sensitive and nuanced debut follows the eldest daughter of a family on holiday as she navigates her growing desires for a prison inmate with her heartfelt but fraying familial love. Under the film’s placid surface is a teenage, and very human, restlessness that suggests impulsive curiosity, yet also wisdom. Stars Lou Aziosmanoff, Jocelyn Lagarrigue, Victor Laforge. Drawing on the same Denis Diderot classic as Jacques Rivette’s 1966 film, Nicloux’s version provides a fresh take on the 18th-century story of a young woman’s (a stunning Pauline Etienne) harrowing experiences in nunneries, one run by a too-loving Mother Superior (Isabelle Huppert). Young Suzanne’s discovery that she’s an illegitimate child compels her to a life in the convent, where inhumanity rules and battles of wills ensue. With Louise Bourgoin, Martina Gedeck, Françoise Lebrun. A brutally intimate close-up of the moment-to-moment dissolution of a love affair, this psychological drama stars Romain Duris as a brooding, bestubbled Parisian juggling a hot-and-cold relationship with a jet-setting careerist (Charlotte Gainsbourg) and the intrusions of a middle-aged male stalker who has claimed him as the love of his life. Fueled by emotionally charged dialogue and nervy, passionate performances, Persecution continues Chéreau’s masterful observation of human desire in all its intricacies and contradictions. With Jean-Hugues Anglade. Set in 1915, a pivotal time in the lives of master painter Pierre-Auguste Renoir and his war-wounded son Jean (who’d become one of cinema’s great masters), Bourdos’ atmospheric drama explores the ways in which creative powers wax and wane as one generation gives way to the next. Key to the changes that father and son experience is a female model who’s the elder painter’s last inspiration, and the figure who may turn Jean’s life around. Stars Michel Bouquet, Christa Théret, Vincent Rottiers, Thomas Doret, Romane Bohringer. A Samuel Goldwyn Films release. Perplexed at the sudden disappearance of her husband, a wife watches hours of videotape that he’s recorded over the previous seven years to piece together some clues. Odoul’s most daring feature, whose color and black-and-white images are culled from his own videotaping, confirms his place as one of France’s genuinely exploratory filmmakers. Stars Marie-Eve Nadeau, Damien Odoul. Jean Renoir, 1951, France/India/US, 99 min. One of a British upper middle-class family of eight living on the banks of the Ganges River, teenage Harriet grows up in a tolerant and loving atmosphere that blends East and West. But when a dashing captain arrives at a neighbor’s home, the girl’s passions are ignited in ways she can barely fathom or control. Renoir’s classic, first color film, presented in a gorgeously restored print, remains a special and deeply emotional work in the master filmmaker’s oeuvre. Stars Patricia Walters, Nora Swinburne, Esmond Knight. Restored by The Academy Film Archive in cooperation with The British Film Institute and Janus Films. Restoration funding provided by The Film Foundation and The Hollywood Foreign Press Association. Renoir’s finest achievement and consistently praised as one of the best films ever made, The Rules of the Game is essential cinema; entire styles of filmmaking (Altman’s for one) are unthinkable without it. As a cast of characters from all classes assembles at a country house, the farce and melodrama commence, giving occasion for everything from hunting parties and gala balls to extramarital affairs and finally even murder. Master filmmaker Leconte makes a startling and unforgettable departure from his previous work with this whimsical animated 3D musical about a family business offering certain special “end-of-life” services. Rather than succumbing to a purely mordant perspective, the movie switches course and mood, driven by the family’s perpetually happy child whom they can’t control. Based on the novel by Jean Teulé and with the voices of Bernard Alane, Isabelle Space, Kacey Mottet Klein, Isabelle Giami, Laurent Gendron. The late Miller’s final film elegantly adapts François Mauriac’s modern classic of a woman’s growing resistance to her suffocating marriage, and showcases a remarkable Audrey Tautou as the disturbed titular heroine. With Gilles Lelouche, Anaïs Demoustier, Catherine Arditi. An MPI Pictures release. Franju’s adaptation of François Mauriac’s novel adheres closely to the source’s flashback structure, while set in a somewhat more contemporary setting, thus providing fascinating contrast to Claude Miller’s new version. Continuing to tap into the extremities of human behavior that engrossed him as an artist, Franju crucially assembled a brilliant cast, including Emmanuelle Riva, Philippe Noiret and Edith Scob, with a magnificent Maurice Jarre score. A hit-and-run accident involving a hotshot car salesman and an émigré worker from Moldavia triggers a chain of dramatic events with life-altering consequences. Corsini’s complex narrative traces the small yet crucial events that expose a character’s true self, and the rottenness at the core of certain nouveau riche. A Film Movement release. The tentative nature of relationships is explored in dazzling, three-dimensional fashion in this cleverly written and directed roundelay between current and former lovers. Aya, the mother of a bright young daughter, struggles to come to terms with the end of her marriage, while hoping to have a child with her new lover. Stars Lou Doillon, Samuel Benchetrit, Malik Zidi, Olga Milshtein. Instead of grooming his son to inherit his lucrative wine-growing business, an imperious vintner (Niels Arestrup) looks to a talented California-based grower, rendering a harvest of jealousy and worse. Legrand’s narrative takes on Shakespearean qualities, driven by a titanic performance by Arestrup, while the film’s observations on the wine-growing business are thoroughly engrossing. A Cohen Media Group release. Some of the most exciting advances in storytelling are taking place in France, with independent creators, corporations, and game companies reshaping how audiences consume stories. At the forefront of this transmedia revolution is the epic pan-European immersive experience ALT_MINDS. When six scientists disappear while on assignment their kidnapping sparks a multinational manhunt. Mysterious online videos, mind-bending puzzles, and clues that point to a dark conspiracy of vast proportions threaten to ensnare the investigators charged with unraveling the mystery. The trick is that in this interactive experience the part of investigator is not played by an actor but assumed by the audience. Game designer, Eric Viennot of Lexis Numérique, will discuss this genre-bending project and the future of storytelling. Arin Arbus has created a delightful, funny (sometimes hilarious!) 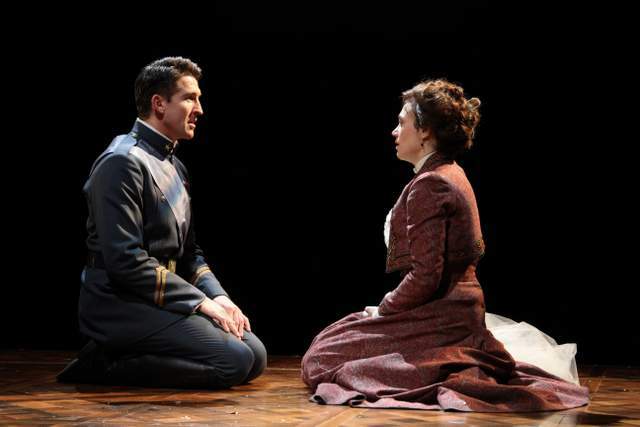 very clear and enjoyable production of Shakespeare's MUCH ADO ABOUT NOTHING, starring Jonathan Cake as Benedick and Maggie Siff as Beatrice. The action takes place on a simple but attractive plain wooden slab -- with a large swing. While the audience enters, an accordionist plays and women are folding the wash. It gives a nice sense of place (without being specific to any location, tho' as described by Shakespeare it's quite specifically "Messina"). It's kind of placeless. There is no particularly obvious time period for the setting either (certainly the accordion is not an Elizabethan period instrument), nor do the costumes spell out a date -- it's kind of timeless. While being specific in the moment-to-moment details, perhaps the staging -- as timeless and placeless -- is intended in part as a metaphor of the "Nothing" in the title. The production uses original musical settings to Shakespeare's songs. In addition to using music and song, the words of the play are broken up with moments of dancing. And the swing on the stage, simple though it may be, works wonderfully. What makes this Arin Arbus production so terrific, is twofold. First: By slowing down some of the "witty" dialog -- which is incomprehensible in many other productions, by adding facial expressions and body language, and by getting the "comic timing" just right, she has been able to make the "wit" witty and the jokes funny. Secondly, she has structured the play and directed the actors so that the strange contrast between the merriment of the first part of the play, and the serious deceptions and betrayals of the second part are jolting but still credible. It's an excellent and very enjoyable production! By the way, in a bold move, TFANA, which has never had a real home of its own, has just been building a new theater in Brooklyn across the street from BAM. It will be inaugurated next season with a new production of A MIDSUMMER NIGHT'S DREAM directed by Julie Taymor.